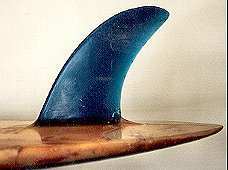 1976 McCoy Rounded Pin 6 ft 6"
Deck: Light blue 'McCoy' script at nose, down stringer. Bottom: Dark blue 'McCoy' script at nose, down stringer. Bought stock by Bob Armitage 1976 from Surf shop cnr. (Old) Highway and, Nowra NSW. Purchased 1981. Extensive repairs, particually to bottom and leg rope damage.